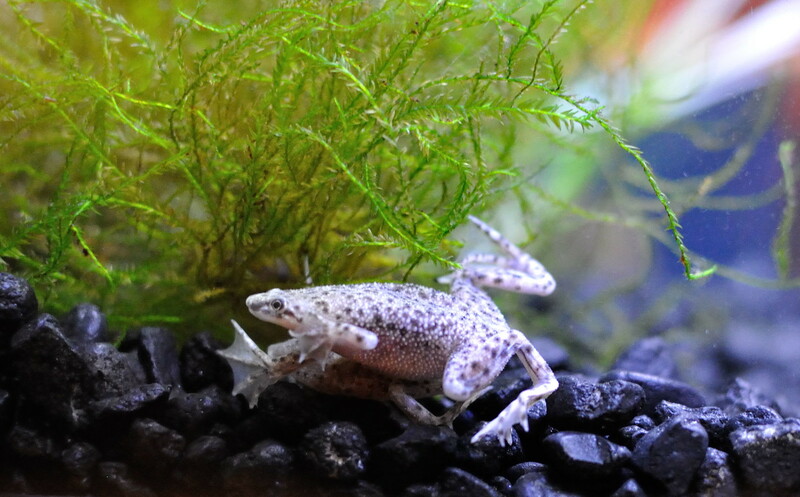 The African Dwarf Frog is a peaceful little chap who adds an interesting element of variety to your aquarium family. Just like Tyrion Lannister, his understated antics will provide you with years of hilarity and amusement. Although he is an amphibian, he spends his entire life in the water. He must surface to breathe, but most of the time, he is submerged. The African Dwarf species, also known as the Aquatic Dwarf Frog or Hymenochiru, originated in rivers and streams of Sub-Saharan Central Africa. Although this diminutive frog matures at a mere 2½” (6cm) in body length, his life expectancy can extend beyond the anticipated five years. When given proper care, some have been known to live up to 18 years. One of his most surprising characteristics is his tendency toward food aggression. He is a notoriously slow eater with very lax feeding behavior, but woe to any fish who tries to grab his mealworm. He will defend it with a surprising turn of sudden vigor. How do I tell if my dwarf frog is male or female? Most frogs are not known for their flashy beauty. The Dwarf Frog is no exception. The males sport a gland behind each armpit called the “Post Auxiliary Subdermal” gland. It is white or pinkish in color. The female is a bit larger than the male, with a chubbier body and sporting a small bump, or cloaca, between their legs. This is where the eggs are produced. The frogs are known for their “Zen position” of floating for long periods with arms and legs splayed, balancing one foot. The scientific term for this behavior is “burbling.” They can remain still for an extended length of time, making some viewers wonder if they are still alive. The frog’s passive nature makes him an ideal tank mate for many species of fish. According to experts, the process of feeding an African Dwarf Frog can be the hardest part about owning one. They are reputed to like shrimp pellets or frog food, but many fanciers find that the frog prefers either live or frozen food, to the point of exclusion. To complicate matters further, African Dwarf Frogs have poor eyesight. Aquarium enthusiasts recommend feeding them with a pair of tongs, to ensure that they are getting enough to eat and the good stuff isn’t being gobbled up by swift-moving tank mates. Tapping lightly on the glass at mealtime is a good way to alert the frogs that dinner is coming. It won’t take long before frogs get the hint and the tapping becomes a dinner bell. Ideally, an aquarium for African Dwarf Frogs should contain 1-2 gallons (4-8L) of water per frog. This offers each individual enough space to swim around while allowing ease of management and cleanliness. If there is not enough water, the aquarium will become dirty in short order. Furthermore, it is very important that the tank does not contain any strong currents. Dwarf Frogs are not strong swimmers and do best in a shallow aquarium, with water no deeper than 20″ (51cm). They need to stay submerged, as despite being amphibians, they will not survive in a dry environment. Since the frogs are passive, it is best to keep them with tropical fish that have a docile nature. Due to his poor eyesight, a frog can quickly become a victim of starvation due to quicker moving, hungry fish who grab all the available food. Adding live plants to an aquarium is always a good idea, and an African Dwarf Frog will benefit from the places to hide and hang out. Frogs will also enjoy a cleaner environment since plants remove nitrates and ammonia from the water. 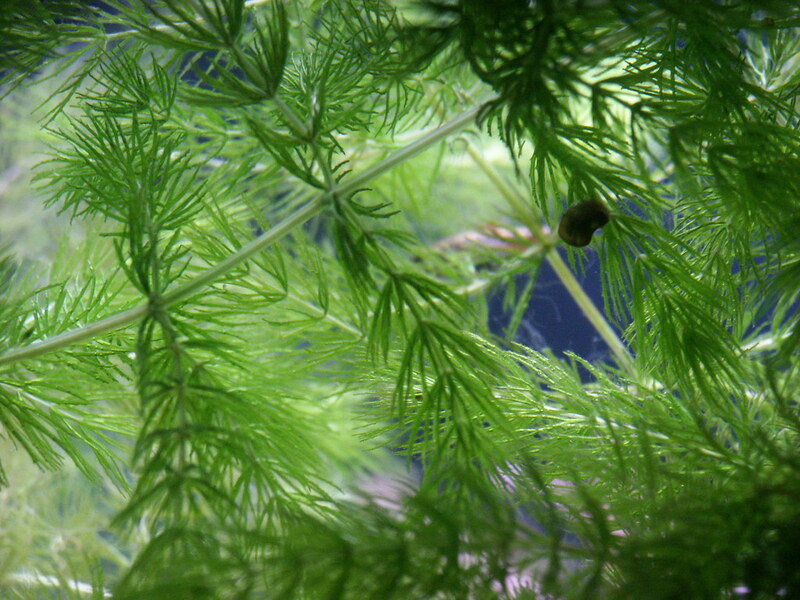 One of the best plants for removing toxins is hornwort. 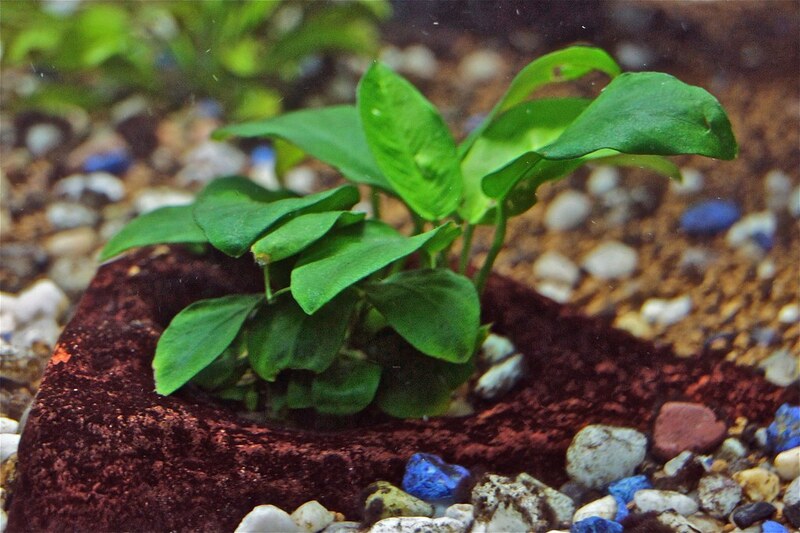 It thrives either as a “floater” or by “rooting,” tying to a rock or item at the tank bottom. 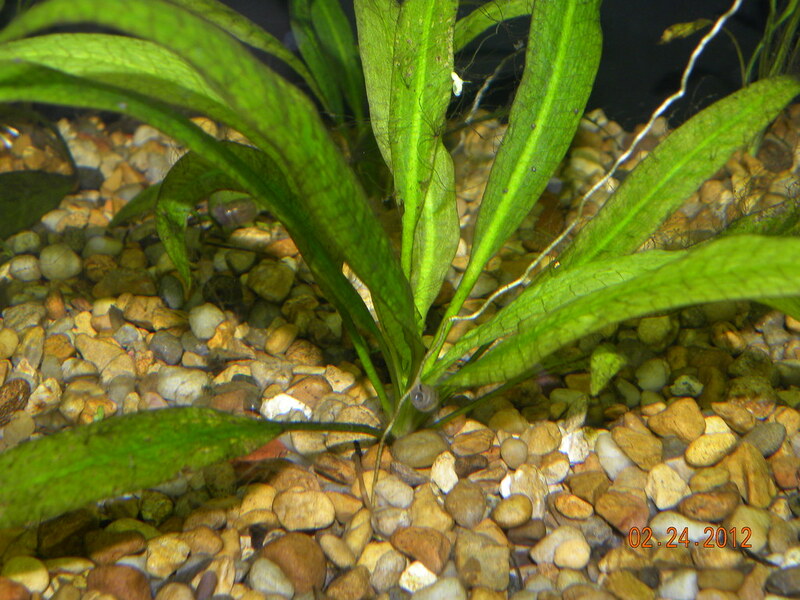 It is a low-maintenance aquatic plant. However, nearly any freshwater plant will work in an African Frog habitat. Frogs don’t show much interest in plants as a rule, and therefore don’t abuse or eat them like turtles or some varieties of fish. Easy care, but requires a significant amount of light. A low-maintenance plant whose leaves offer substantial hiding place for frogs. 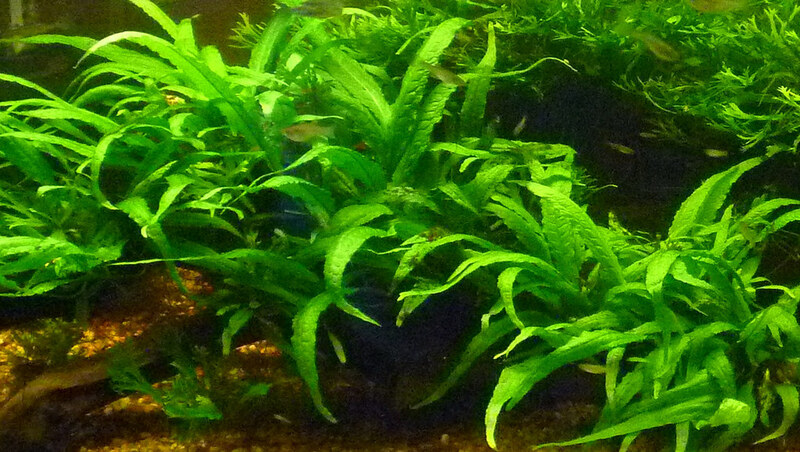 An excellent water cleanser, java moss can be used as a carpet in the tank. It is very easy to maintain but does best in well-lit conditions. Very hardy and a good choice for an aquarium without substrate. If you tie it to a bit of rock or driftwood, it will eventually attach itself. You also might be wondering: what are some African dwarf frog tank mates? Being docile by nature, an African Dwarf Frog can typically coexist peacefully with any number of freshwater fish. Many ask: can my African dwarf frog live with a betta? Even a Betta fish may tolerate an aquatic frog. You must take certain precautions to make sure there is no animosity or territorial challenge in the beginning. The relationship ultimately depends on the temperament of your Betta. If you have one that is particularly aggressive, the frog will probably have to move out. This is something that requires experimentation before you can make a decision. It’s impossible to predict the outcome. 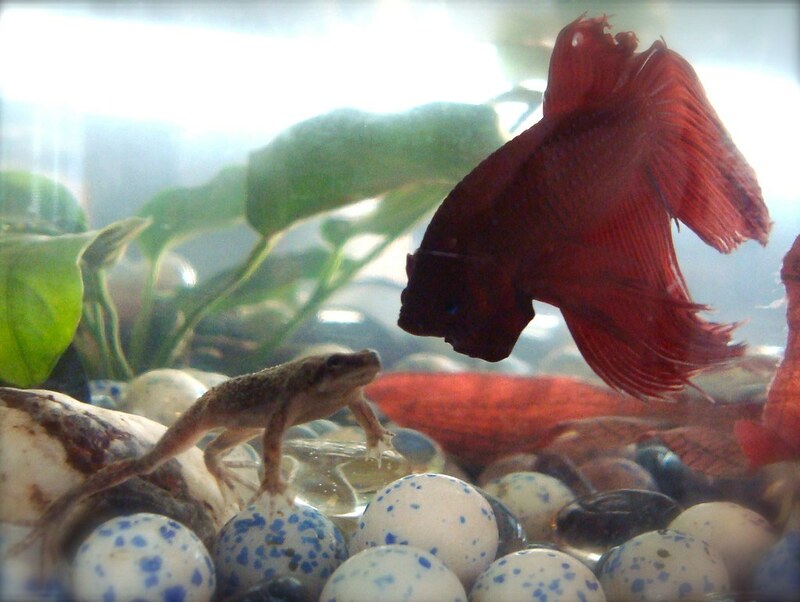 Surprisingly, a Dwarf Frog that feels threatened can become aggressive toward a Betta. A frog can move through the water much faster than a Betta fish. If there is a dispute, it typically happens over food. Therefore, a peaceful tank is most likely to occur if you make sure that your frog is well fed on a daily basis. Also, Bettas are often set up in a bowl, and that type of environment is not appropriate for frogs or bettas. Bettas can tolerate a lower level of water quality, while a frog’s habitat has to be kept clean. However, a new frog owner should not hesitate to place a couple of frogs in a Betta tank, so long as the tank is an appropriate environment where frogs can live. Often, they will get along just, well, swimmingly. Most reptiles and amphibians are vulnerable to Salmonella, bacteria that can cause illness in people. African Dwarf Frogs have a history of causing large outbreaks of diarrhea due to infection. Most people recover, but it can be very serious for children, the elderly, or others who may be immunocompromised. Frogs that are carriers will shed the bacteria in their feces. It can be difficult to tell when frogs are sick. Sadly, by the time the aquarium keeper notices a difference in the frog’s condition, such as a significant thinning of the body, it may already be too late to do anything for the little guy. However, certain skin conditions can be treated. An observant frog keeper will notice a change in the frog’s energy. To notice lethargy in a creature that spends most of its time floating around takes a real eye. A loss of appetite, though, is very telling. This often is an indication of a parasite. 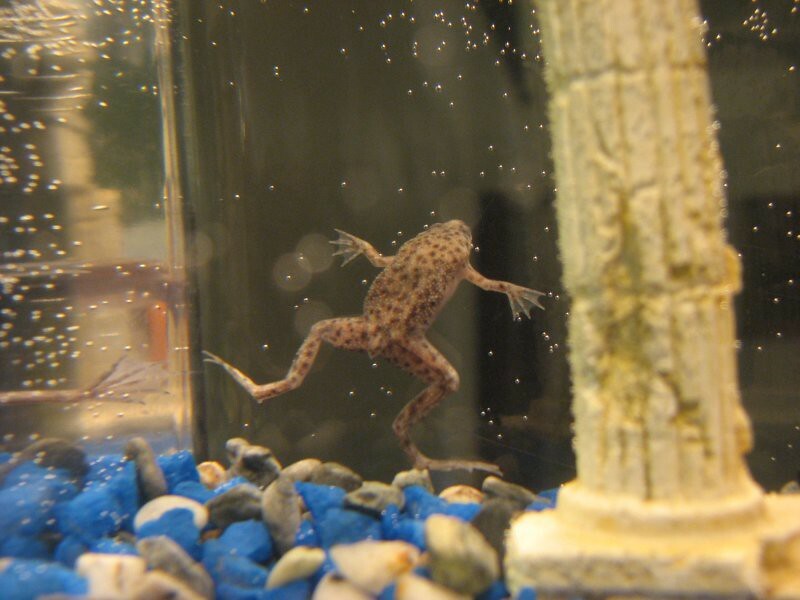 You may be asking yourself: how do I tell if my dwarf frog has parasites? External parasites often show up on the skin. Close inspection will reveal tiny leeches or mites. Bacterial infections can show up as red spots on the skin. Fungal infections are fuzzy white spots, which develop into raw sores as they grow. Keeping snails with frogs is a practice that should be avoided, as snails carry parasites that are bad for frogs. As they say with anything, an ounce of prevention is worth a pound of cure. A clean tank and good animal husbandry will do wonders for preventing infections and save your entire tank. The sad thing is that these infections can affect a whole group of frogs. Dwarf Frogs like having company and do best in groups of two or more. They are highly social. Their environment in the wild is subtropical, so they thrive in water that is warmer than 70F (21°C). Since they are nocturnal, they appreciate having the tank lights off for 12 hours or so each day. These details will make life stress-free for your frogs and ensure them a long and healthy life. Be sure to exercise personal hygiene when handling any frog or amphibian or cleaning any aquarium. Don’t touch your face while handling frogs, and always be sure to wash hands thoroughly with soap and water after handling them. Water spills should be cleaned up promptly. Dropsy is considered severe bloating that makes the frog look like a balloon. This is due to a large build-up of fluid in their body. If the diet of your frog is mainly freeze dried food it can cause bloating and gas retention when digested. This is very common in african dwarf frogs and can be reduced with a diet of live blackworms and daphnia. 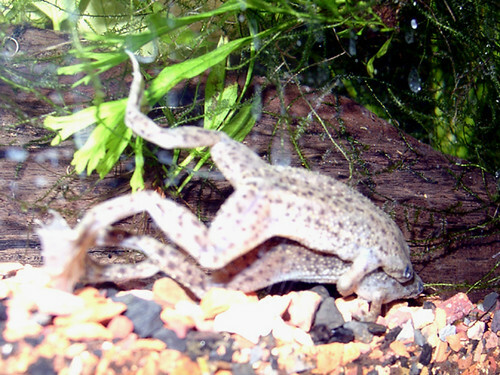 Frogs who are mating will perform a series of entertaining acrobatics. They should be kept in a tank separate from other fish, with water at a depth of 4-6″ (10-15 cm). Water that is cooler than their normal home tank will induce them to spawn. If you decide to breed your frogs, the eggs should be removed as soon as they appear and placed in a tank of their own that is maintained at a temperature of 74F (23°C). This will prevent predation by other frogs. The parent frogs will eat their own eggs and tadpoles. When the tadpoles hatch, they can be fed commercial tadpole powder, but they will soon appreciate a diet of real meat, such as brine shrimp and bloodworms.